Our large willow tree continues to be the main attraction for our preschool aged children. We have some expert tree climbers and the low branches are ideal for encouraging novice tree climbers making their first attempts. A volunteer Mulberry tree was loaded with fruit early this summer and provided many purple fingers as we enjoyed harvesting the mulberries before the birds got to them. The dramatic play stage is host to songs and presentations as the marimba and last year’s gourds are played. Thanks to Forest ReLeaf of Missouri and their “Project CommuniTree” we have been busy planting trees in our Outdoor Classroom this past year. In October 2014, seven Willow Oaks were planted by the preschool with the help of the Nature Literacy class from main campus. A Bur Oak tree was planted to provide shade for the playground sandbox and a Kentucky Coffee tree was planted in Levi’s Peace Garden. In April 2015, twelve Smooth Sumac trees were planted around the dirt/mud pit and around the sand area. A Bald Cypress tree was planted in memory of Levi and we held our 2nd annual celebration and tree dedication for Levi’s Peace Garden. Levi’s family joined our staff and center families as we blew bubbles and had a cook-out together. Many families gathered old metal pots and pans and we attached them to the fence to help create a “musical fence” for the children to make up tunes. Two families helped provide new tree stumps and tree cookies. 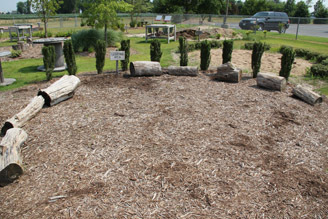 The gathering area tree stumps were replaced and a new “stepping stone” path was made with some of the tree cookies. Donations provided heritage seeds for a “Moon and Stars” watermelon patch and a raised garden bed of milkweed plants has attracted Monarch butterflies. The Toddlers added dill to their herb garden and they have crooked neck squash and zucchini plants growing this year.